You’re all fired up to tackle a brand new DIY project. You’re ready to buy your dream outdoor material by the yard. You’re itching to get started and only one question stands in your way: How much fabric should you buy? It’s a good question. 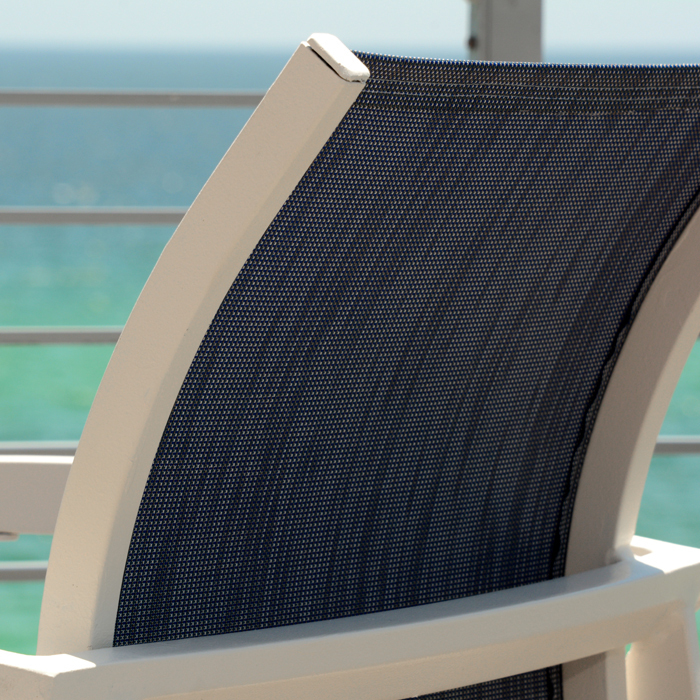 When you’re buying top quality designer fabric for your outdoor furniture, it’s an investment. If you’re working within a set budget, you don’t want to overestimate and end up with yards of leftover fabric. However, the only thing worse than buying too much fabric is buying too little. It’s incredibly frustrating to run out of fabric when you’re halfway through a project. Not only can it quickly derail your project, but it can also be a waste of time, money and effort. So, what do you do? Calculating outdoor upholstery fabric by the yard is a science that changes from project to project; there isn’t one tidy answer. Nevertheless, we can give you some guidelines, tips and tricks to help make sure you are able to accurately calculate the correct amount of fabric needed for most of your outdoor upholstering projects! No matter what home design project you’re undertaking, no matter how big or small, there are a few rules that apply to all projects. With these tips in mind, you’ll be set to accomplish your project with as little pain as possible -- and using the right amounts of fabric to keep it well within your budget and to be sure you’re making the most of your time! Layout makes a big difference. The amount of fabric you’ll need will depend on how you lay out your pattern pieces. Wholesale outdoor fabric intended for upholstery generally comes on bolts that are 45 inches (114.3 cm) wide, which is helpful to know. With some graph paper, you can experiment with different pattern piece layouts to see how much you can fit into each yard. You don’t want to grossly overbuy, but do err on the generous side. Once you’ve made all your calculations, think about adding another half yard (.5 m) on top of your final number. It won’t break the bank, but it could save your bacon. If it turns out that you don’t need it for your original project, there are lots of great ways to use up half a yard of fabric, such as a pair of throw pillows, some placemats, or even a tote bag! With so many options, you don’t have to worry about any excess fabric going to waste. When you’ve really gotten the DIY bug, having a little extra fabric to add to your “stash” is a good thing. Every project has its own unique fabric requirements, so the most important thing is knowing how and where to take the necessary measurements for each type of outdoor furniture DIY project. Phifer has created a series of detailed “how-to” guides for some of the most popular projects to get you started in the right direction. From chaises and loungers to patio dining chair pads, replacing the fabric on your favorite outdoor furniture gives it a new lease on life. There is such a wide variety of furniture on the market that it’s impossible to give you hard and fast rules for estimating outdoor patio fabric by the yard, but we give you some of the most important measurements you’ll need. Our reupholstering how-to guide will walk you through the process. Throw pillows and cushions come in all shapes and sizes, but the most common sizes are an 18” x 18” (46 x 46 cm) square and a 12” x 18” (30 x 46 cm) lumbar pillow. Remember, when you’re making a cushion cover, you’re going to need to double that, plus room for thickness, plus a seam allowance. Add it all together, and you’ll know how much fabric you’ll need for each cushion. 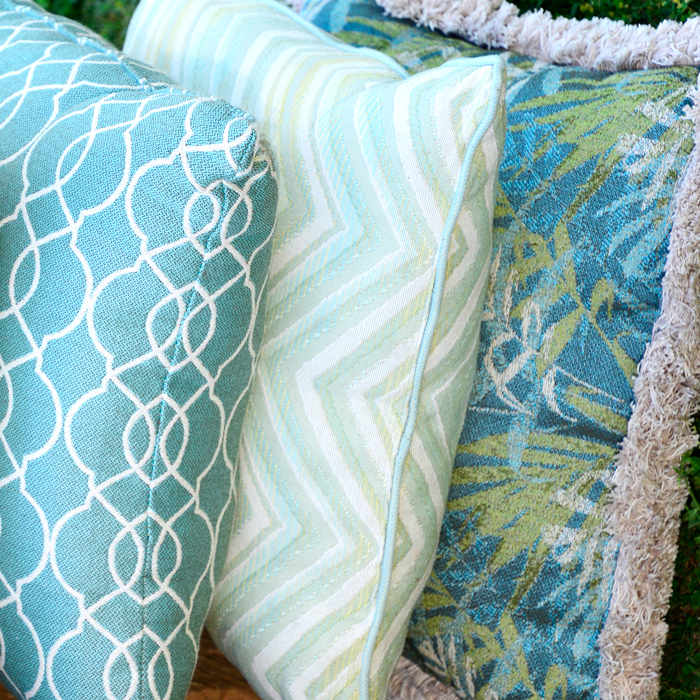 We show you how to make these calculations in greater detail in our comprehensive how-to guide for creating outdoor cushions and pillows. 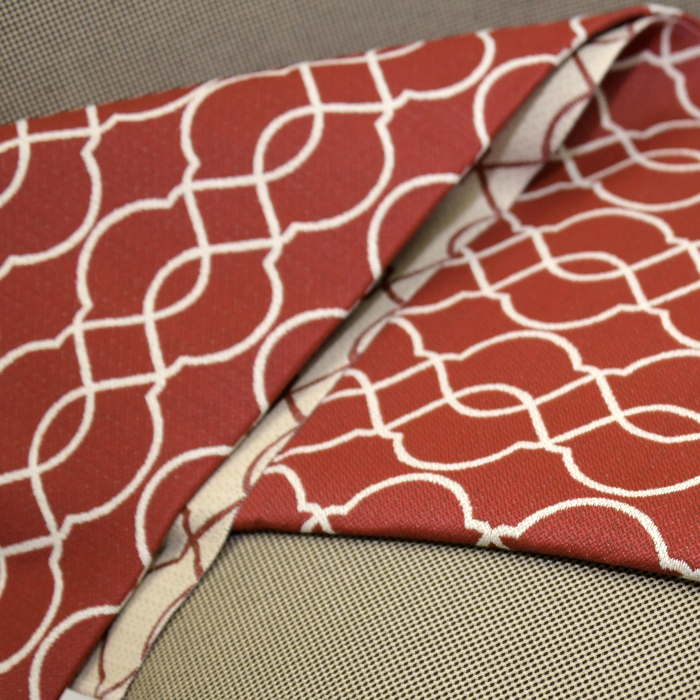 Most chair sling projects fall into the 1 ½ to 2 yards (1.4 to 1.8 m) per chair range. However, once again, sling chairs vary so much in size and style that you’ll have to measure yourself to discover the right amount of fabric to buy. Explore our sling chair replacement guide to find out how to measure your existing chairs for their new slings. Like those trusty square throw pillows, outdoor curtains are a great beginner’s project, and calculating yardage for these is easy. Phifer’s in-depth curtain how-to guide explains everything you need to know about calculating material by the yard for drapes. Sometimes, even when you think that all of your measurements and calculations are correct, and you’ve given yourself wiggle room, you can discover that you need more fabric to finish the job. If you’ve run out of your favorite Phifer Designed Fabric and need to get your hands on some more yardage, don’t worry. We sell bulk outdoor fabric to retailers online and around the country. Take a look at our Where to Buy page for more information, or just get in touch with us! We have a team of friendly experts standing by who would be happy to talk with you over email, the phone or live chat. We can help you source extra fabric and answer all your questions. While you’re still in the planning stages of your outdoor DIY project, why not spend some time experimenting with the Phifer Outdoor Fabric Visualizer? This exciting tool lets you mix and match different colors and textures, using our sample images to preview the final look. 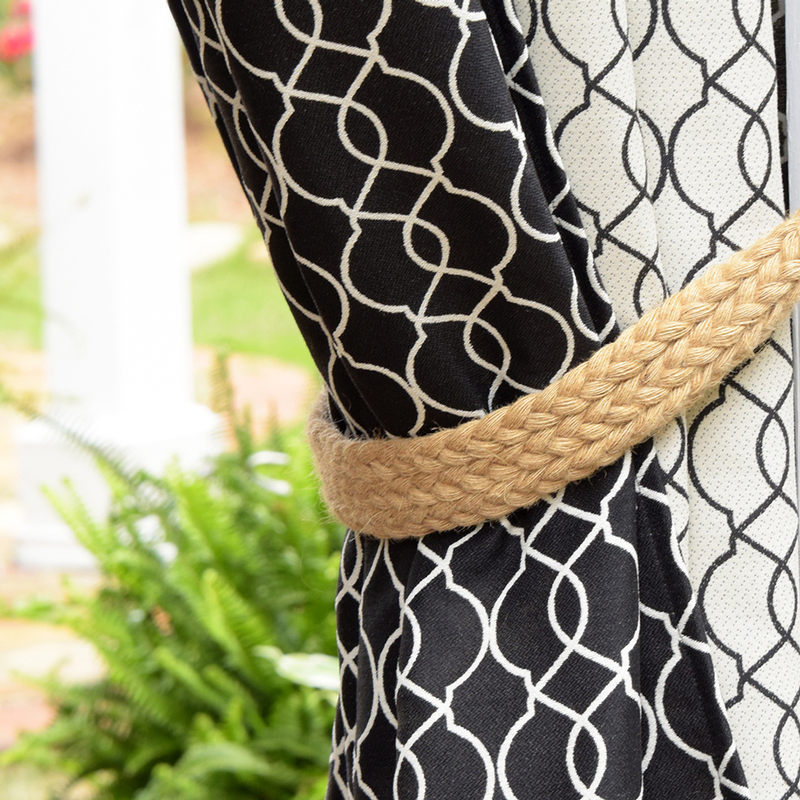 It’s a fun way to explore all the gorgeous combinations possible with Phifer’s designer outdoor fabrics.